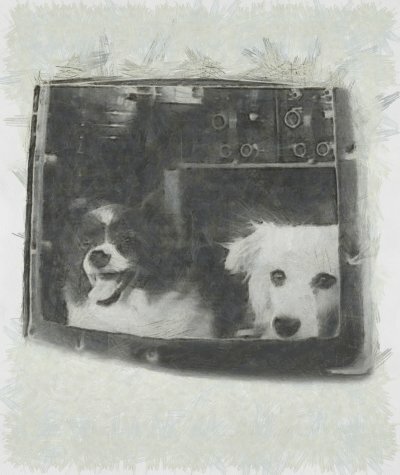 Damka and Krasavka proved to be very hardy dogs when they were planned to make an orbital flight on 22 December 1960 as a part of the Vostok programme. Like other early space exploration, their mission was dogged by a catalogue of technical problems and failures. After takeoff, the upper stage rocket failed, and it started to plunge back to Earth. Protocols put in place for such an eventuality failed; the ejection system (meant to eject the dogs in a capsule and then parachute back to Earth) failed, and so did the self-destruct system which was supposed to be initialised after ejection. The craft had a secondary back up self-destruct, set for 60 hours after the return of the craft to Earth. With this window of opportunity, a rescue team was quickly dispatched to try and rescue the capsule’s inhabitants. No doubt aware of the public feeling over the canine cosmonauts, they were keen to act swiftly. As a consequence, the capsule was discovered quite quickly, but the failing light and minus 45 degree temperatures hampered their efforts to disarm the self-destruct mechanism. The combination of the heavy impact and viciously cold temperatures left the rescue team believing that there was no hope of recovering the dogs alive from the capsule. The heavy snow and frost on the windows made it impossible for the team to tell if any creatures had survived, and so could only report that no signs of life were apparent. On the second day, the team worked feverishly to disarm the self-destruct and open the capsule. Upon opening the capsule, barking was heard, and both dogs were recovered. They were wrapped in blankets and furs and flown back to Moscow immediately. They were cold and shaken from their ordeal, but apparently recovered fairly quickly, given their ordeal. In fact, Oleg Gazenko (the senior scientist who regretted the death of Laika), adopted Krasavka and she was well enough to mother a litter of puppies during her lifetime. Krasavka lived for another 14 years, until her death, with the Gazenko family. As with much of Soviet-era information, there are as yet, no references to where Damka was rehomed.